We all want our face to look its best – it’s our most prominent feature, always exposed to the world. When your face looks good, you have that extra boost of confidence that radiates from within. Problems with blemishes, dull or uneven skin tones, and visible signs of aging like tiny lines and wrinkles can all affect the way we feel about our looks. Microdermabrasion is a technique that solves many of these issues, and if you’d like smoother, clearer, younger-looking skin, it may be the perfect solution for you. What is microdermabrasion? It has a long, complicated name, but the concept is simple. Microdermabrasion treatments involve exfoliating the skin with microscopic crystals to remove dead skin cells, clear up clogged pores, evening skin tones and stimulating healthy skin renewal. The treatment is perfect for those with acne because it thoroughly removes dead skin cells and pollutants that can clog pores and cause issues that lead to acne. When pores are clogged, they are more susceptible to bacterial infection, which causes those breakouts we call acne. Microdermabrasion is one of the most effective non-surgical anti-aging treatments because its exfoliating process stimulates the skin’s cell renewal and collagen production processes. As we age, these processes slow. With less collagen to keep skin tight and elastic, small gaps begin to form, and wrinkles and fine lines become visible. When stimulated, your skin can speed up its self-renewal and fill in those gaps. Speeding up the skin renewal process can also help those with dull or uneven toned skin. Because skin cells are replaced more rapidly, skin tones even out. Your skin will have a healthy glow because all those dead skin cells are removed and replaced by new, healthy cells. In addition to uneven pigments, microdermabrasion also helps reduce the appearance of scars. Microdermabrasion is safe for all skin types and can be customized for your individual needs. 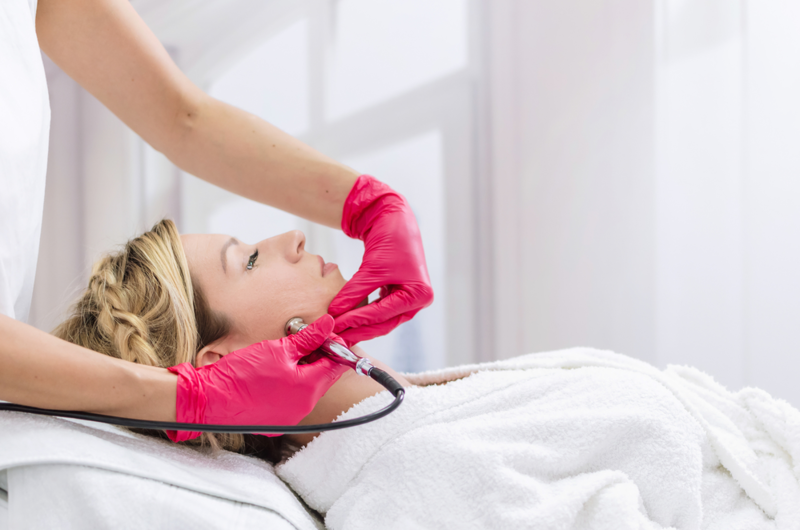 A consultation with your esthetician is needed before beginning the treatment, and best results are seen after a series of six to ten treatments. Microdermabrasion treatments are relatively quick, effective, non-invasive and painless. Everyone can benefit from microdermabrasion. To try it for yourself, make an appointment for a consultation today at Utopia Salon & Day Spa. Our well-trained, professional estheticians are dedicated to helping you look and feel your best every day! We’ll create a customized treatment plan that is best for your individual needs and fits into your busy schedule. Find us at 510 North East Avenue in Vineland, New Jersey or call us at 856-794-9200 to schedule an appointment. If you prefer to instantly schedule an appointment yourself, download our free mobile app at the iTunes Store, on Google Play, or on Amazon.